Keyboard: WASD to move, J+K to rotate camera. I am so lazy about making games, there was a thread made about it. This is my first game. Dear god, what have I done? Sorry to you folks who like inverted camera rotation. I take criticism well, so tear this thing apart. (Be constructive). edit: Also sorry to Linux and Mac gamers. This is a GAME MAKER CLASSIC™. Note: keys J and K now rotate the camera. Wow! Looks really cool! I like such games. What did I just play?! 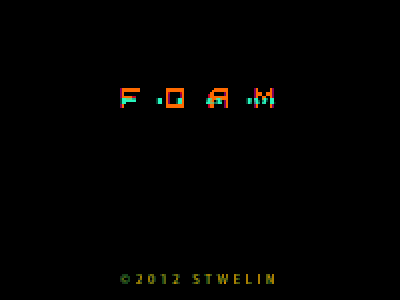 This is very strange, like an increpare game .. and I like it. I only had 5 minutes to play, but from what I saw it looks good. 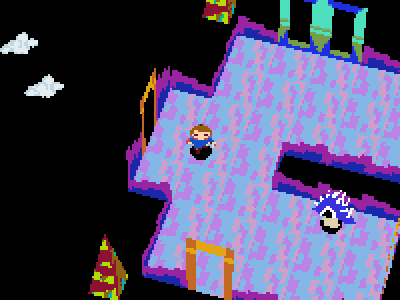 I did get very lost and when I turned into a spiky mushroom I started to get freaked out a little. Thanks, my monitor is probably out of whack. Very surreal and pretty though. Admitting you have a problem is the first step to .... recovery? Success as an indie game dev? D'oh! Guess beggars can't be choosers. Agree about the grass textures, they can be a little jarring. So I delivered three eggs and turned into a Moon and went to space... and "Two out of three"
So I guess there's more, but i don't know where. Sub walking animation: I like the waggle, but occasionally the degree of it was a little tricky making me think i had turned more than I had. maybe more subtle? The cosmic squiggles are not enumerating your eggs. That's all I will say for now! This happened with my controller once as well. I found that re-plugging it seemed to fix the calibration. Thanks for playing. WOW. I was really skeptical when I first started controlling my character and I got REALLY confused for the first few minutes. But then I stopped trying to make sense out of everything and started getting the hints. This is a masterpiece, but I couldn't finish it yet. Maybe I'll try some more tomorrow. - There was no music on the very first locations, was this intended? - Some sound effects were way too loud (in my opinion). Like the creatures shooting lightning. - I didn't know I could rotate my view. Only found that out by reading the other comments here. Maybe squeeze in the key bindings before the game? There wasn't supposed to be music for the first section, no. I am thinking about adding some light tune there. Thanks for your feedback. I will incorporate info for the control scheme in the next build. And yes, there are a few different endings and death sequences. I'm really enjoying this game so far. The world is bizarre and colorful enough to keep me wanting to explore and find out what's down each path, and I like the lines of dialogue the characters have. Haven't made that much progress solving the puzzles yet, but I'll probably come back to the game later (speaking of which, as save feature would be nice.). Wow, this is one of the strangest games I've played in a long time... It begins in a very confusing and bizarre way but after a while you get totally immersed in that strange world. There were times when the game got frustrating, when I died and had to start all over again, but the mystery surrounding this world kept me playing. Congratulations on a wonderful game. And now...could anybody tell me what the cosmic strings do? I've found all 3 of them but I can't seem to figure out what to do next. And one more thing, what's the fan supposed to do? I keep dying when I walk into the fan but I don't see what else there is to do in there.. This is wonderful, thanks for sharing! I wish there were more games like this. Very immersive for me, I love the visual style. Request: I want to share this with some people, if you could possibly do an update where the arrow keys control the character (very counter-intuitive that the huge buttons with arrows on them do not move the dude on screen) then that'd be awesome! Thanks again for sharing. A fuckton more interesting than my first game. EDIT: Sorry there wasn't any actual feedback in this post I was linked here externally so I thought it was the Announcements forum. If I think of any I'll post it as well. please visit if you have time, thank you. 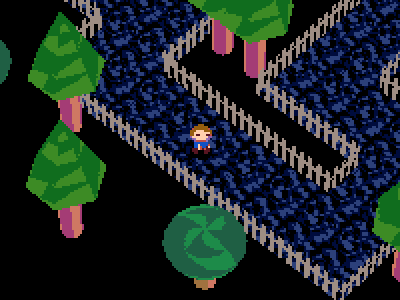 I eventually figured out that you basically just change into something else to bypass a previously locked "gate", but after a while I didn't really have any motivation to go on. 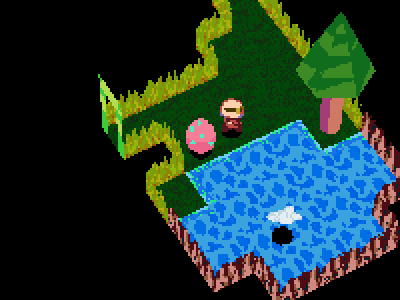 At one point I was an egg, but I fell in the water and it was gone. I don't know if I needed to be that egg for something... I was kind of put off by not being able to tell how things were meant to look. Regardless, well done on your first game. I thought about a save feature, but in the end I didn't feel the game lent itself to being put down and picked up later in the middle. I never enjoyed this aspect of long RPGs. I always come back after a break and forget what I was supposed to be doing. I'll put it in the next build. Thanks. I was kind of put off by not being able to tell how things were meant to look. Regardless, well done on your first game. Things are meant to look how they look. If they were meant to look differently, I would have made them so! Thank you. edit: ok i beat the game and got all 3 secrets (space, underwater area, checkerboard area). i don't think that getting the secrets actually matters though since i got the same ending, but i got two of the endings so far (alone with umbrella, girl without umbrella) is there anything i'm missing? anyway, great game here, it's been too long a time since i played a game that i thought had a unique and brilliant surreal atmosphere (games like uin, lackadasium, yume nikki, space funeral, glum buster, etc). 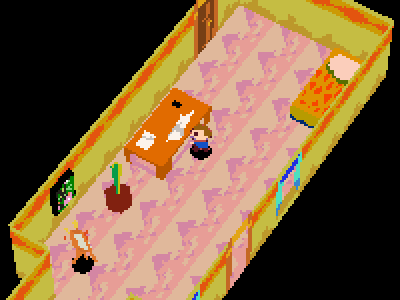 by any chance were you inspired by yume nikki or LSD when made this (psx style graphics, egg collecting, etc)? i personally like the pixelated aesthetic because for a lot of the characters and graphics it leaves a lot of interpretation to the player as to what they actually are. 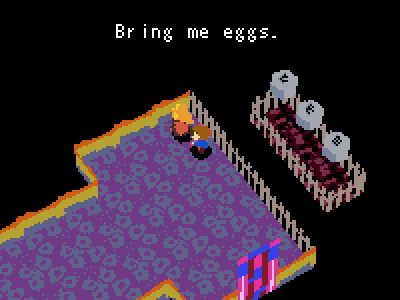 for instance, i could swear the guy telling you to collect the eggs was pyramid head. the music was spot on and it added so much to the atmosphere of the game. anyway, i'll shut up now and stop raving like a fan girl but first i must say this was one of my favorite game maker game experiences, and i look forward to seeing whatever you do next.